There is always a revolutionary period of the breaking down of old conventions and customs which follows after every great war; and this rebellion against existing conditions is to be noticed in all life to-day. Unrest, the desire to break the shackles of old ideas and forms are abroad. So it is no wonder that young people should have become so imbued with this spirit that they should express it in every phase of their daily lives. The question is whether this tendency should be demonstrated in jazz--that expression of protest against law and order, that bolshevik element of license striving for expression in music. The human organism responds to musical vibrations. This fact is universally recognized. What instincts then are aroused by jazz? Certainly not deeds of valor or martial courage, for all marches and patriotic hymns are of regular rhythm and simple harmony; decidedly not contentment or serenity, for the songs of home and the love of native land are all of the simplest melody and harmony with noticeably regular rhythm. Jazz disorganizes all regular laws and order; it stimulates to extreme deeds, to a breaking away from all rules and conventions; it is harmful and dangerous, and its influence is wholly bad. A number of scientific men who have been working on experiments in musico-therapy with the insane, declare that while regular rhythms and simple tones produce a quieting effect on the brain of even a violent patient, the effect of jazz on the normal brain produces an atrophied condition on the brain cells of conception, until very frequently those under the demoralizing influence of the persistent use of syncopation, combined with inharmonic partial tones, are actually incapable of distinguishing between good and evil, right and wrong. 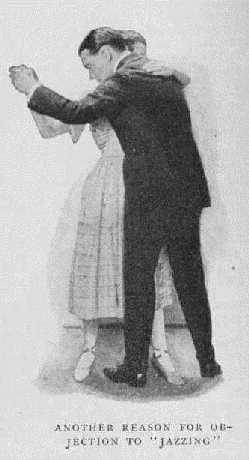 Dancing to Mozart minuets, Strauss waltzes and Sousa two-steps certainly never led to the corset check room, which now holds sway in hotels, clubs and dance halls. Never would one of the biggest fraternities of a great college then have thought it necessary to print on the cards of invitation to the "Junior Prom" that "a corset check room will be provided." Nor would the girl who wore corsets in those days have been dubbed "old ironsides" and left a disconsolate wallflower in a corner of the ballroom. Now boys and girls of good families brazenly frequent the lowest dives in order to learn new dance steps. Now many jazz dances have words accompanying them which would then never have been allowed to go through the mail. Such music has become an influence for evil. Last winter, at one of the biggest high schools in one of our largest cities, a survey was made of the popular songs of the day by the music supervisor, who suggested that a community sing be held for one assembly each week. He requested the students to bring all the popular songs to school that a choice might be made of what to sing. At the end of two weeks he had in his office over two thousand "best sellers." He asked the student body to appoint from among themselves a committee of six to choose the songs to be sung at the assembly. This committee, after going through the two thousand songs, chose forty as being "fit for boys and girls to sing together." With this evil influence surrounding our coming generation, it is not to be wondered at that degeneracy should be developing so rapidly in America. In a recent letter to the author, Dr. Henry van Dyke says of jazz: "As I understand it, it is not music at all. It is merely an irritation of the nerves of hearing, a sensual teasing of the strings of physical passion. Its fault lies not in syncopation, for that is a legitimate device when sparingly used. But 'jazz' is an unmitigated cacophony, a combination of disagreeable sounds in complicated discords, a willful ugliness and a deliberate vulgarity." Never in the history of America have we more needed the help and inspiration which good music can and does give. The music department of the General Federation of Women's Clubs has taken for its motto: "To Make Good Music Popular, and Popular Music Good." Let us carry out this motto in every home in America firmly, steadfastly, determinedly, until all the music in our land becomes an influence for good. Return to the gateway site for "Does Jazz Put the Sin in Syncopation" or (re)read nonlinearly by choosing from the following sections. [Introduction] "The Rebellion" "The Elements of Music" "Its Effect"